At marginal cost system efficiency is improved. Audio / Visual alarms at pump house and at remote location. Stroke Counter for recording periodic status of maintenance. Automatic Battery Charger for main and standby battery. Change over switch for main and standby battery. Least hot work required at site. Jockey pump set package consists of following pars mounted on a base plate. Kirloskar make vertical multistage high efficiency pumps with diffuser casing suitable for frequent starts and stops. Kirloskar make vertical motor suitable for above pump. Pressure switches required for automatic operation with air release valve pressure gauge and pressure pulsation dampening device. Diaphragm tank with Neoprene diaphragm precharged with air. This tank takes care of very small leakages through glands flanges. Selector switch for Auto/Manual operation. DOL Starters voltmeters ammeter et. Stroke counter to record each start of pump. Necessary piping with all gate valves, non return valves etc. required for the system. Wiring between motors control panel and pressure switches. The following equipments are mounted a rigid floor standing frame. Timer to crank the engine for 5 seconds and rest for 15 seconds. Designed for three kicks with facility to adjust the duration of operation. Indications for set running, Hydrant pressure normal, low diesel level set on auto, set fails to start, overspeed trip, low lube oil pressure, highwater temperature, hooter off. Audio alarm for set fails to start, and low diesel level. Independent Trickle and Boost facility for main and standby battery, Voltmeter, Ammeter for battery status indication. Battery changeover switch from main to standby battey. Lockable battery enclosure and tool box. Battery-Set of batteries for starting the engine 10 times consecutively. One set working and one set as standby. This panel is to be located where 24 hours attendance is expected. The panel gives following Audio/Visual alarms. Set running, set fails to start, low diesel level. Indication for power ON and set on Auto. Arrangement of positive suction for jockey pump and main pump. Main Hydrant line should hold pressure, 1.5 times working pressure for at least 30 minutes. Flanged connection on suction and delivery side of 40 mm for jockey pump connection. Connecting point and a TP switch to be provided on bus bar to take power connection. Hydrant system and diesel engine etc. 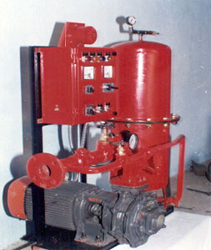 Automatic Fire Fighting Pumpset Packages with a electric pump and a standby diesel engine. Turnkey contracts in Fire Protection Systems including HYDRANT, FOAM AND SPRINKLER systems.